Bacterial and viral nucleic acids are recognized by intracellular TLRs in the cell after the they been taken up into the cells by endocytosis. Dendritic cells phagocytize microbial and host cells killed through programmed cell death (apoptosis). In the process of maturation, surface protein expression is altered, allowing the cells to leave the peripheral tissue and migrate to the lymph nodes where they activate T cells through the antigen presentation methods described above. They also control lymphocyte movement through release of chemokines. 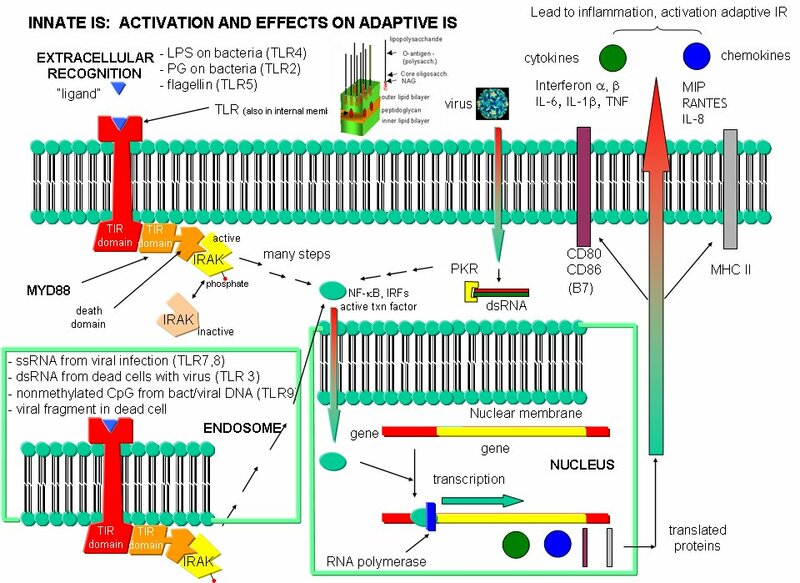 The very large figure below shows the processes involved in recognition of PAMPs by TLRs of innate immune system cells. A model of dsRNA interacting with the ligand binding domain of TLR3 is shown below.